Here we go again with my one-pot meals. I love stuffed cabbage and have all the ingredients to make one but with the snow we are getting in Connecticut I decided to make soup. 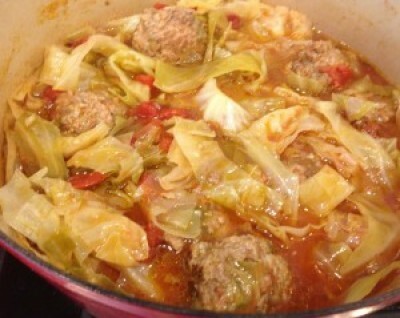 This Paleo recipe is delicious and I hope you try and enjoy my un-stuffed cabbage soup. I only used about 1/4 head of cauliflower and 1/2 of a zucchini. Shredded through my food processor and the measurement was 1 1/4 cup total. That amount seemed perfect for 1 1/2 pounds of meat. If you use more then add more of the cauliflower/zucchini mixture. For the meatballs: In a large mixing bowl, combine the ground meat, cauliflower/zucchini, salt, pepper, cumin and onions. Form into 1-inch balls. Heat your soup pot and add in olive oil. Sauté until all sides are brown. About 7 minutes. Remove any excess grease. For the soup: If you need an extra olive oil add it now if not: Add the onions and sweat until translucent then add in garlic about 3 minutes. Next add in crushed tomatoes, chicken broth and bring to a boil. Add in tomato pasta and stir with a spoon to mix into liquid. Add salt and pepper. Cover and lower to medium and cook for about 10 minutes. Take cabbage and remove core and inner white part. Cut into thin slices and add to the pot. Cover and set temperature to a medium/low for 20 minutes. Add in lemon juice and cook for an additional 10 minutes. Enjoy with your favorite garnishes or toppings!